Where did September go?! Autumn is upon us and we are into the last few months of the year. I know many of you have booked your Christmas appointments, but for those who haven't please note that the week before Christmas is now full and the cancellation list is open. So what is happening this month? So there you have all the sets. As you can see they already have massive savings on RRP (the ultimate cleanse & glow trio being 52% off RRP alone), and I have slashed the price again to be internet beating. You won't find them at this price anywhere else! I will be off November 12th-18th so if you want anything booking around that time get to www.bookarh.com to grab your place now! Lovely weather in May wasn't it? Let's hope June gives us more of the same. Remember to use an SPF daily, prevention is better than cure! First up, all this month all microZone® treatments will be £20 instead of £24. If you are going to or from a specific destination a new set of holiday protocols have been designed to keep your skin looking its best. So if you've never tried one before, now is the time. Receipt coupon this month is for a manicure for £17.50 in June (saving £2.50). This will also come with a free OPI Avojuice hand and body lotion (worth £2.25). Remember to keep your receipt following each treatment as there are different offers on all the time, and if you don't want to use it you can pass it on to a friend to use. This years father's day is June 18th. If you don't fancy getting him socks, why not try the Dermalogica® limited edition shave essentials set. Available for £15.50 and add on a skinsolver® 10 minute treatment voucher for just £4.50 extra (normally £10). First up why are the lips different to the rest of the skin on your face? Well the answer is that your lips have no stratum corneum (outermost layer of your skin, typically 15-20 layers of flattened cells). This means in comparison we only have around 3-5 layers on our lips. Another feature is a reduced complement of oil and sweat glands. The only source of moisture to the lips is saliva, which dries out natural oils from the skin around the lips. As a result, moisture evaporates from the lips much faster than from the rest of the skin, causing lips to dry out easily leaving you to develop fine feather lines. Lip balms are a popular quick fix, however they may contribute to the issue. Heavy mineral oil based balms can reduce the production of natural barrier protection, which then leads to a cycle of having to reapply as your own protection is reduced. In severe cases, you may notice when you stop using these products your lips become flaky and even split and bleed. Avoid mineral oil or petroleum based lip balms. Nourish dry lips with treatments rich in plant oils like shea butter, which restores the natural barrier and hydrates. Lipstick bleeding? The main muscle of the lips is circular and as it contracts, the skin puckers. Ageing skin loses elasticity and, particularly if lips are drier, fine feather lines can develop. Smoking and sipping through straws will accelerate this. Lipsticks are wax based, so they warm and melt on application causing them to run and 'bleed' into these fine lines that radiate from the mouth. Try applying a primer to the lips first to set your lipstick and avoid this problem. Lips losing volume? After 30 we start to lose collagen, which is the skin fibre that gives strength, tone and volume. In fact we lose 1% collagen per year from the age of 30. It is normal for lips to suffer progressively decreased volume decade on decade because of this biological change. Keeping lips well hydrated will improve the perception of volume. Solution? New Nightly Lip Treatment. Launching on 8th June, this rich overnight treatment firms, hydrates and restores the lip and perioral region, smoothing the appearance of laugh and feather lines while you sleep. Ingredients include Indian Genetian extract, which firms by increasing epidermal thickness and smooths feather lines. Sesame seed extract increases hydration to boost volume and decrease the appearance of lines and wrinkles. Shea butter restores barrier function while hyaluronic acid and apple extract (which provides a saccharide complex) along with advanced volumising technology, enhance hydration and smooth. New Nightly Lip Treatment is £47.50 and samples are available now. Launch of Stress Positive Eye Lift is 6th April. I have decided to extend the pre-order promotion into April after the launch, because I'm nice! So you can buy the new product and get a free eye lift skinsolver®. Add in your regular eye treatment as an extra purchase and I'll give you Soothing Eye Makeup Remover (worth £23.50) for free! Did someone say prom? If you have a little cherub who is off to one this year (and won't shut up about it), remember prom ready skin is made now, not the week before. This is why I am giving you the chance to get their skin 'on fleek' (I assume I'm using this right, I have no idea). For £100 you can have the complete Dermalogica® Clear Start range, designed for teenage skin, and a professional microZone® treatment. All worth over £140 when purchased separately. Also for £100 this month is the entire Dermalogica® Shave range. Perfect preparation and post care, reducing post shaving lumps and bumps. I'm also throwing in a free microZone® Treatment with this bundle too! A relaunched version of Callus Peel now is suitable for use during pregnancy! To celebrate the relaunch you can add on the Callus Peel treatment to any skin treatment booked this month for £20 (usually £30) AND take away post care foot lotion worth £9.99 for free! As it is nice to have hands and feet done at the same time, you can also add a manicure onto your appointment for £15 (usually £20) and take away a free OPI Avojuice hand lotion. When you book online at www.bookarh.com you will pay the regular booking fee and the discounts will be made at checkout on your appointment day. Get booking now, with the Easter weekend some spaces are filling up fast! A little bit about why you shouldn't buy from us this Valentine's Day. Last year we did something bold, rather than saying "come and buy a voucher for a skin treatment (AKA Facial) or purchase this product" like other retailers, we said "don't buy anything from us...unless you've been asked". Why did we do this? Because every year we have people come in to use vouchers after Valentine's Day who were looking forward to the treatment, but a tiny upset they had a gift that says "Here, make your face nicer". Instead we told you to take your other half out to do something they and you could both enjoy. And we also had a nice response from people who actually did want a nicer face (well skin), and asked the other half for a voucher. This year is no different. So instead of going out and buying something they may not like, ask them if they would like to go on a day out, book a weekend away or even just have a nice night in. If you KNOW they would love something from us, then we are here. The receipt promotion is still on, so remember not to throw yours away. You can get LVL Enhance lash treatment for £30 instead of £40 in February. Dermalogica® promotions for this month are freebies galore! Buy Power Rich intensive treatment (ideal prep before a big event) for £142.40 and get a free IonActive Treatment AND full sizes of Skin Resurfacing Cleanser and Anti-Oxidant Hydramist. A total of £276.20 of treatments and products meaning a saving of £133.80! 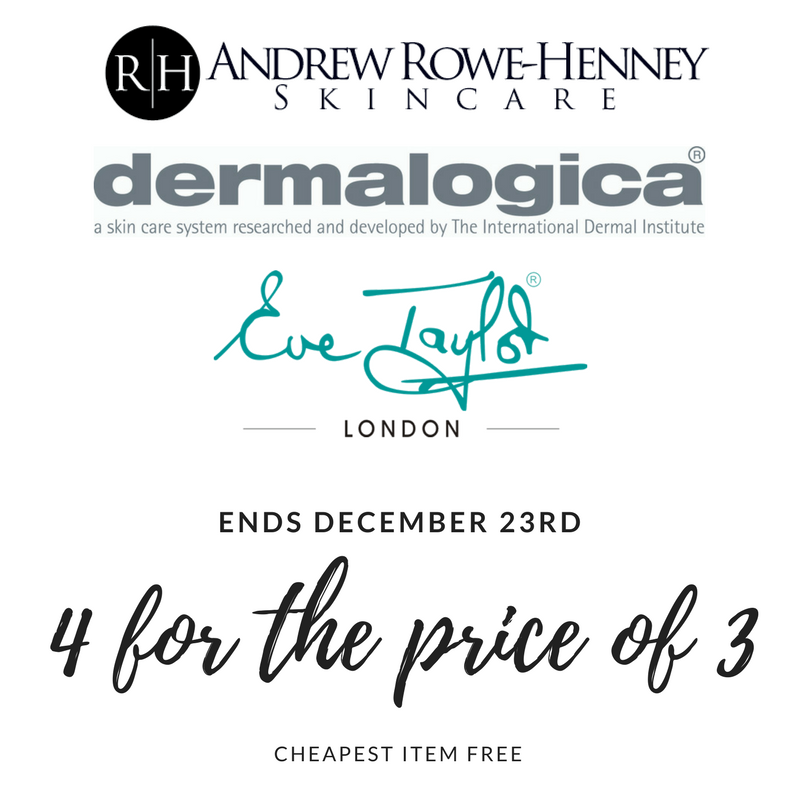 Buy three get one free on all skin treatments. Meaning if you buy in advance you can take advantage of one of the above freebies! At the start of January I made a pledge to make any change I could to make the world a bit better. And hasn't it been a right month where it really could be better? Anyway, I said I would give a £1 for each treatment performed. I've done just that. Each month on the last day I will use the suggestions I've heard from you throughout the month when you visit to make donations to various charities and organisations. Below is a list of things that just by visiting me in January you have had a part in. Thank you from me and from those you have helped. Paid for water purification tablets to make 20,000 litres of water drinkable in emergency situations, when the fresh water supply is compromised. And also internationally is something a bit different. Microfinance institutions; these are local institutions that borrow money to local entrepreneurs for them to start/expand their business, which will lift them and their families out of poverty. This is done through local lenders who support the borrower with lessons in bookkeeping and finance management. It means they do not have to rely on a lender who might take advantage of them. And rather than one person or company like us lending their whole loan, it is split between multiple lenders. The business owner pays back their loan and the exact amount we lent them comes back for us to help someone else (no profit is made by any lender). This month we have helped for funding towards the expansion of the salon business of Silvana Cueva from Catamayo, Ecuador. She will be using the money, once fully funded, to purchase equipment and products. Her business supports herself, her mother and also provides work to an assistant. So there we go. Just for coming in and getting your brows done or having a skin treatment you have helped people locally and across the world, well done you! February will see the launch of two new initiatives. The first being Knowledge base, the first post of which will be uploaded next week. It will contain lessons on product use, skin conditions and generally anything else that I get asked questions about. Next time you visit ask for the password. The second is a new Facebook group called ARH Skincare Last Minute. If you search for this on Facebook and add yourself I will approve you. It is a closed group which will have any last minute appointment cancellations and the occasional promotion if a space is left in my day. Well worth taking a look at if you have a day off and are at a loose end! The year is flying by and it's holiday time! Well for some people at least. It is a busy end of month already as I will be on annual leave for two weeks commencing 29th August. There are still some spaces left at the time of writing for next week and the week after. Sarah will be in on Thursday and Friday both weeks that I'm not here too. Massage - Sarah's promotion runs through to the end of August, which if you missed it in last months newsletter is £12 for back, neck and shoulder massage or £20 for full body (that is a £10 saving on the regular price!). Receipt coupon this month - Pedicure for £18.50 to be used in August. Now on to a couple of additions. You will be pleased to note our polish collection now has the Autumn/Winter Washington D.C. collection from OPI added. Along with an additional collection of shades from the OPI Infinite Shine line. If you are unfamiliar with Infinite Shine; It is a polish that provides a gel like shine without the need for curing, that lasts up to ten days. The gloss that seal it actually cures in natural light providing high resistance to chipping. And the best part is there is no removal process. It is easily removed with any polish remover. Also we have a limited number of Dream Duo sets containing Nail Envy with Avoplex Oil available for £16.50. That's all for August (well not quite, there is a new Dermalogica product being launched on 8th August). And winner of last months Body Therapy kit was Nerieshia Coathupe. Next months prize is a Dermalogica Rescue Me! kit. To win, simply come in for any Dermalogica treatment in August. Dermalogica® promotion: Spend £70 on products this month and get the Skin Detox Set worth £33.50 for free. It contains travel sizes of Multi-Active Toner, Charcoal Rescue Masque and Hydrablur® Primer (Tip: even men can use this one, the tint is so subtle). Scrummi has been appointed our new disposable towel provider. This is in keeping with our goal of becoming a carbon neutral company. The towels are 100% biodegradable, made from certified sustainable sources and by using them we reduce our energy, water and detergent use massively. This added to the fact that they are hygienic, as everyone gets their own towel means they are better for you, us and the environment. Over the next few months there will be news on new treatments being added to the menu so stay ahead and sign up to the newsletter on the website. It can contain special promotions not listed here and more recently a massive HD Brows giveaway that you wouldn't have been aware of if you only keep up to date on here. Competion time: Same as last month and month before. Come in for a Dermalogica® treatment and get entered into a draw to win a body therapy kit. Last months winner was Tanya Maughn. Good Luck to all of you coming in this month! SPF and why it is not just a thing for holiday. The main issue people have when they come in to see me is ageing concerns followed by pigmentation. The issue with SPF use, in this country at least, is that it is seen as a 'holiday' item or for the odd day out at the beach. UV rays are present whenever it is light, even when cloudy you are exposed to UVA, which is the long-wave band that causes wrinkles and pigmentation. Both UVA and UVB contribute to causing skin cancer. If you are not familiar with the different types, you are not alone. Quite often 'broad spectrum' protection is mentioned. This means that it provides protection against UVA and UVB, and should be the base standard you look for when choosing an SPF product. Now, here is where is starts to get complicated (and hopefully explained). SPF is not a specific amount of protection as such, it indicates how long it will take for UVB to redden the skin (UVB is the main cause of sunburn as it affects the top layers of the skin more). If we take an SPF 15 it will mean it takes your skin 15 times longer to redden your skin than your skin would normally do without sunscreen (remember your skin is different to other people and you may redden quicker). It also screens approximately 93% of the sun's UVB rays. SPF 30 protects up to 97% and SPF 50 up to 98%. So when choosing what SPF to use we need to look at a few different factors. Day to day is a simple start. If you work in an office or indoors you are unlikely to need a high SPF. Although UVA can penetrate glass, UVB doesn't so easily. So a lower factor is perfectly fine depending on your skin. If you work by windows, maybe think about raising your SPF level. When it comes to outside working a higher SPF can be used. And if you have a manual job outside and are prone to sweating, try a water resistant SPF. Holidays are a time when you might find it beneficial to raise your SPF always remembering to reapply regularly and recognising that water resistant does not mean water proof! Before you go away or even if you are looking at year round sun protection keep in mind I am here to have a chat with you about your options and have a wide range of solutions from Dermalogica® the brand developed in the land of perpetual sunshine, California (making it a brand that takes sun protection seriously). Any purchase of Dermalogica® products over £60 in May will get you a free microZone® and if one of your products contains SPF (or After Sun Repair, which turbo charges your skins recovery rate and also makes a fab after wax care product!) you get to take home the stylish beach or yoga tote bag (as pictured, towel and yoga mat not included). Get prom ready with a Clear Start microZone® for £20 instead of £24, and when you purchase 2 Clear Start products (including kit) you get a free Prom Prep Kit to take along wherever you go, so you never have an excuse to drop your routine for a night! If you came in for a treatment or purchased a product from mid April you will have been given a receipt. These receipts are carbon neutral (I don't like waste either) and will be given after every treatment or product purchase. The great news is now, there is a monthly receipt promotion. If you have one, you'll know April's had a coupon for a microZone® for £20 to use in May. Receipts in May will have a coupon on the bottom for use in June in our biggest ever treatment give away, for a free underarm wax, which is a treatment worth £6! If you have it done regularly, you'll know how fantastic smooth underarms can be and if you've never had it done but always thought about it, now is the time to try. Coupon must be presented at time of treatment and you may pass on coupons to whoever you like. It is finally here! From May you will be amongst the first in the country to be able to experience the power of IonActive™ Power Treatment, which delivers a personalised bio+charged therapy for more visible, rapid results. This action packed treatment combines thermal activity and the latest treatment room technology to optimise product penetration for rapid skin health results. Your skin will look and feel dramatically improved, with reduced signs of skin ageing, uneven skin tone, acne or dehydration. To celebrate the launch of this treatment, courses purchased in May will be reduced to £150 for 3 or £290 for 6. The treatment is normally priced at £60 per session and booking is available from the first week of May. Proms are coming and there is no better way to prep for prom than by combining the Dermalogica® Clear Start system with results driven microZone® targeted treatments. When you buy a Clear Start Kit for £23.75, you get a Clear Start microZone® for free. Or for the special price of £79.99 get the kit and a course of four Clear Start microZone® treatments to combine a full home care routine and treatments at the hands of a skincare expert. Block booking - 4 hour block booking of ANY treatments (assuming sensitivity tests are done) for £120. Take your pick and build your own perfect treatment plan. Some recent examples of things people have had; 1: Dermalogica skin treatment® and 4 additional touch therapies, RH 4 package, Thermal back purification, Brow tidy. 2: LVL Enhance, HD Brows, Full body aromatherapy massage, Full leg wax, Under arm wax. Obviously you can pick whatever you fancy, these are just suggestions. But it's a nice way to give yourself a treat don't you think? You and a friend can win a Dermalogica skin treatment® and the prescribed home kit for your skin. To win, refer someone in this month who hasn't been before, When they book any appointment from a free face mapping, a microZone® right the way up to a BioSurface Peel and mention you sent them (or email me their name), you will both get added into a draw to win a full hours treatment followed by the selection of a skin kit to take home, all for free!